PAX East '13: Taking Control of Time with "Super T.I.M.E Force"
Super T.I.M.E Force was already a chaotic, fun, and innovative game when it was being shown at PAX East 2012. There was rarely a moment over the weekend that their booth was empty; all those 'Best of Show' awards would suggest why. Capybara Games should’ve been satisfied with the reaction they had already gotten, but their pursuit of a better game meant otherwise. At PAX East 2013, while co-hosting a booth with Double Fine Productions, players had more control over the game. The initial build of the game saw a player take on the role of heroes inspired by retro icons in the year, “198X.” Inspirations came from past video games, television shows and even musicians. “The game used to be about playing, dying, rewinding back to the start and playing alongside all of your past lives,” said Nathan Vella, co-founder of Capy. When a player died, he would be taken back to the beginning of the stage, but that character’s last run will be kept intact as a recording, until the point of death. Preventing the recording from dying gives you a check point. In the latest build, the player can press the B button at any point to rewind back to any part of the stage, and re-spawn with a character of their own choosing. This, along with the addition of a 60-second time limit, adds a unique wrinkle to an already chaotic game. “There are a lot of times when you’re going to waste a whole bunch of time and realize, ‘holy crap, I don’t have enough time to finish the level,’” he says. The player can now rewind back, using a mechanic called, “Time Out,” to the very beginning and optimize their play-through accordingly. The extra control over the rewinding mechanic also allows the player to pick a specific hero for certain tasks. Not every hero will be immediately available however, as it will be up to the players to rescue the other playable characters to unlock them. 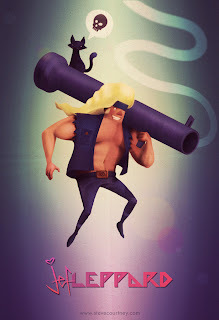 Just as players had to rescue Jef Leppard in the previous demo, Capybara Games have introduced a new hero that needs saving; Lou Don Jim, the laser-sword knight. “Each one of the characters is mostly like, trying to think of interesting combinations,” Vella stated in terms of game-play. Lou Don Jim is lazy, unshaven and has bad hair. He also wears a bath robe. Along with Zackasaurus, inspired by Teenage Mutant Ninja Turtles, Jef Leppard and a host of other characters, it seems like Capybara Games is on the right track with that goal. Vella says there are still other T.I.M.E Warriors that have yet to be revealed, along with different eras, through which those new characters can be rescued. The team is also currently working to ensure that the game has value upon multiple playthroughs. The plan is to allow the player to go back to previous levels to regain lives. This means that past sessions will be recorded and left intact for the player to work with. 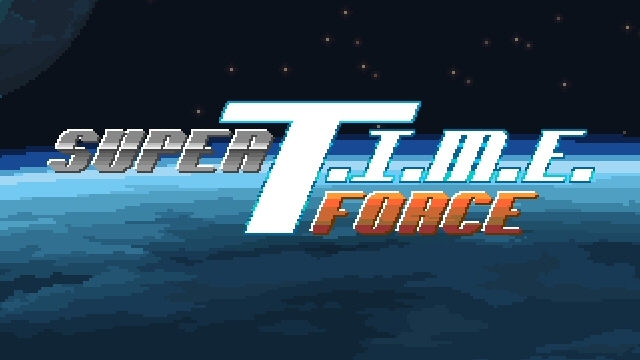 Despite the big changes made to the game, Super T.I.M.E Force is still about the tones and the jokes in the game. The game is slated to be released sometime late in 2013, and is being published by Microsoft for the XBox Live Arcade.